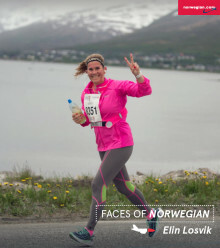 Norwegian announced today its entry into the Canadian market with three new routes. The airline will launch seasonal service from Montréal to the French Caribbean islands of Guadeloupe and Martinique in late October. Additionally, Norwegian will launch the only transatlantic flight out of Hamilton International Airport near Toronto, in March 2019, with daily service to Dublin, Ireland. 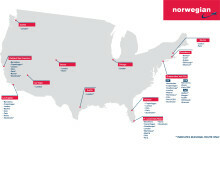 U.S. demand has remained high with over 60 % of the transatlantic tickets purchased within the U.S.
Norwegian, the World’s Best Low-Cost Long-Haul Airline and Airline of the Year 2017, announced today it will launch three new routes from its existing Florida cities to Europe this fall: Fort Lauderdale-Hollywood International Airport to Madrid and Rome; and winter seasonal service from Orlando International Airport to Stockholm. 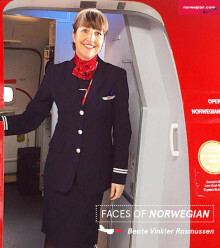 Norwegian today launches its first flight from the United States to Amsterdam's Airport Schiphol. The airline’s first-ever nonstop flight to Amsterdam from the U.S. departs from New York City’s John F. Kennedy International Airport this evening. Norwegian carried more than three million passengers in April, an increase of 16 percent compared to the same month previous year. As expected, the figures were affected by Easter which was in March in addition to the launch of new long-haul routes. Norwegian, the World’s Best Low-Cost Long-Haul Airline and Airline of the Year 2017, yesterday launched its latest nonstop service from the United States to Paris with its new flight from Boston Logan International Airport to Paris Charles de Gaulle Airport. The airline now operates seven routes from the U.S. to Paris. Norwegian is increasing frequency on its route from New York to London, beginning October 2018. 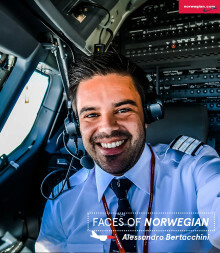 Norwegian today reported its first quarter earnings for 2018 with a result of NOK -46.2 million (-$5.8 million). The quarter was characterized by international expansion, strong passenger growth and higher fuel cost. A successful private placement of shares was completed this quarter. Norwegian is increasing frequencies on routes from New York to Dublin, Edinburgh and Shannon and from Providence to Dublin beginning winter 2018. Norwegian Air launched two new routes from Chicago and Austin to London starting March 25, and March 27, respectively. Norwegian is the first low-cost airline to offer transatlantic service from both cities.